We’re thinking about solar power over at the Azimuth Project, so Graham Jones wrote a page on solar radiation. This led him to a nice little geometry puzzle. If you float in space near the Earth, and measure the power density of solar radiation, you’ll get 1366 watts per square meter. But because this radiation hits the Earth at an angle, and not at all during the night, the average global solar power density is a lot less: about 341.5 watts per square meter at the top of the atmosphere. And of this, only about 156 watts/meter2 makes it down the Earth’s surface. From 1366 down to 156 — that’s almost an order of magnitude! This is why some people like the idea of space-based solar power. Why? Because the area of a sphere is four times the area of its circular shadow! Anyone who remembers their high-school math can see why this is true. The area of a circle is πr2, where r is the radius of the circle The surface area of a sphere is 4πr2, where r is the radius of the sphere. That’s where the factor of 4 comes from. Cute and simple. But Graham Jones posed a nice followup puzzle: What’s the easiest way to understand this factor of 4? Maybe there’s a way that doesn’t require calculus — just geometry. Maybe with a little work we could just see that factor of 4. That would be really satisfying. But I don’t know how to “just see it”. So this is not the sort of puzzle where I smile in a superior sort of way and chuckle to myself as you folks struggle to solve it. This the sort where I’d really like to know the best answer. But here’s something I do know: we can derive this factor of 4 from a nice but even less obvious fact which I believe was proved by Archimedes. Take a sphere and slice it with a bunch of parallel planes, like chopping an apple with a cleaver. If two slices have the same thickness, they also have the same surface area! There’s an interesting cancellation at work here. A slice from near the top or bottom of the sphere will be smaller, but it’s also more “sloped”. The magic fact is that these effects exactly cancel when we compute its surface area. The surface area of any slice of a sphere matches the surface area of the corresponding slice of the cylinder with the same radius. If you don’t get what I mean, see the picture at Wolfram Mathworld. So we get that factor of 4 we wanted. But from Dionysius’s own city of Syracuse I will summon up from the dust—where his measuring rod once traced its lines—an obscure little man who lived many years later, Archimedes. When I was questor in Sicily [in 75 BC, 137 years after the death of Archimedes] I managed to track down his grave. The Syracusians knew nothing about it, and indeed denied that any such thing existed. But there it was, completely surrounded and hidden by bushes of brambles and thorns. I remembered having heard of some simple lines of verse which had been inscribed on his tomb, referring to a sphere and cylinder modelled in stone on top of the grave. And so I took a good look round all the numerous tombs that stand beside the Agrigentine Gate. Finally I noted a little column just visible above the scrub: it was surmounted by a sphere and a cylinder. I immediately said to the Syracusans, some of whose leading citizens were with me at the time, that I believed this was the very object I had been looking for. Men were sent in with sickles to clear the site, and when a path to the monument had been opened we walked right up to it. And the verses were still visible, though approximately the second half of each line had been worn away. I don’t know what the verses said. It’s been said that the Roman contributions to mathematics were so puny that the biggest was Cicero’s discovery of this tomb. But Archimedes’ result doesn’t by itself give an easy intuitive way to see where that factor of 4 is coming from! You may or may not find it to be a useful clue. This entry was posted on Monday, October 11th, 2010 at 5:51 am and is filed under mathematics, puzzles. You can follow any responses to this entry through the RSS 2.0 feed. You can leave a response, or trackback from your own site. I would look at it from the point of iterating the surface integral. Start with a point at distance r and integrate over a half-circle to get half the circumference. Then integrate that over a half circle to get half the surface area. Then integrate that over half a circle to get half the “surface volume” of a hypersphere, and so on. The volume of the interior is the integral 0 to r of the formula for the surface. Hi, Mike. When you first told me this, I thought I understood you. Now I don’t. Could you say in a bit more detail how you get the number 1/4, or 4? I’d think in terms of mapping the area of the circle onto the area of the sphere (I’m using plain English here, not any sort of mathematical terms of art), i.e. the diameter of the circle is 2*r, and it’s thus possible to lay out 3.14 circles around the surface of the sphere… so we tile the surface of the sphere with three circle areas, and we’ve got space left over. Maybe the problem might be easier with a transformation into cylindrical coordinates? Beats me. Beats me too. I don’t know how to solve the problem this way. I don’t know how to ’tile’ the sphere with 4 circles of the same radius. This region is now called the “lune of Hippocrates”. If any of you out there are bored someday, sitting in an airport or something, it’s a great puzzle to prove for yourself what Hippocrates proved around 450 BC. However, because the surface of the sphere is not flat, the ancient Greek techniques don’t work on it… which is undoubtedly why Archimedes was so excited when he worked out the area of a sphere! After posting my puzzle about the lune of Hippocrates I felt an obligation to solve it again, to check if it really is “great”. I had seen the answer, but forgotten it. And it really is great. It took a while to find, but there’s a beautiful solution that fits neatly in my mind. I remember that when I first saw this problem, it seemed very scary. It’s nice when things get clear when you think about them. This picture shows how we can use a paraboloid to project the sphere on a plane. The projection preserves the area. The sphere slices project like in the Archimedes’ hat-box theorem, but they end in the plane sectioning the sphere. Half of the sphere projects onto a circle of double area than that of the section circle of the sphere, so here is the factor of 4. Coincidentally, I’d been wondering about why the volume of a cone is one third of the volume of a cylinder into which it just fits. Of course one explanation — probably not the sort you want — is that the area of a circle is proportional to r2, and when you integrate r2 from 0 to 1, which happens when you work out the volume of a cone by slicing it into thin discs, you get 1/3. The same integral shows up when you want to prove that the volume of a square pyramid is one third the volume of the cube into which it just fits. But it would be nice if there were an argument that didn’t involve calculus. Once you’ve shown that a particular pyramid has volume (1/3)(height)(base), you can use affine shifts, dissections, etc. to convince yourself that the formula holds for ALL pyramids and cones. I had thought about the problem of the “4”, without getting anywhere (apart from learning about the “Archimedes symplectomorphism”, as V. I. Arnold puts it). Here’s an answer to the cone vs. the cylinder question. It is possible to give a geometric answer to the analogous question for a square pyramid vs. a square prism: Start with a cube vs. a square pyramid with height = half the edge length of the cube. You can put six such pyramids in the cube. This cube has twice the volume of the square prism containing the pyramid in the way the cylinder contains the cone. Thus, volume of square pyramid = 1/3 volume of square prism containing it, for the particular aspect ratio we are considering. But we can scale the picture vertically to see that the result holds for square pyramids of arbitrary aspect ratios. One can then argue that cone vs. cylinder (in fact, pyramid vs. prism for any type of base shape) works the same way, by comparing them “slice by slice” to a square pyramid and prism with the same aspect ratio and base area. shows up when you want to prove that the volume of a square pyramid is one third the volume of the cube into which it just fits. and similar formulas hold in any dimension. Second, if we can show this volume formula for a pyramid whose base is a triangle, we can conclude it’s true for any other pyramid, by approximately chopping the base of that pyramid into tiny triangles. How do we chop a triangular prism into 3 triangular pyramids of the same volume? they form a triangular prism. So, we get the magic factor of 1/3. It’s probably easier to learn calculus. But this argument is pleasant if you notice the relation to the Eilenberg-Zilber theorem: a fundamental theorem about taking the product of two simplices and chopping it into simplices, with the help of permutations. Here we are chopping a product of a 1-simplex and a 2-simplex into three 3-simplices. I had given almost exactly the same answer, apart from two minor changes: 1) I divided the cube into six *square* pyramids by taking the tips of these pyramids to be at the center of the cube, and bases to be at the faces of the cube, but you use triangular pyramids. I find the square pyramids easier to visualize/count. 2) In order to generalize from a square pyramid to an arbitrary one (e.g., a cone) I proposed to compare the cone to a pyramid with the same base area and height, and keep in mind that thin “horizontal” slices with the same areas will have the same volumes. You propose dividing the cone into pyramids with infinitesimal base areas. I find the horizontal slicing somewhat easier to follow, but YMMV. Ah, very nice thanks MKZ that argument appeals to me. Elegant! Why to divide cube to six pyramids? You can divide cube to only three 4-pyramids with equal volume. Pyramids have the same peak, same main base area a2 and height a.
I asked a question on MathOverflow looking for a nice explanation of the higher dimensional analogue of that observation of Archimedes. I didn’t get as geometrically intuitive an answer as I had hoped for. But you did get pointed to Karshon’s work on toric varieties and the Duistermaat-Heckman theorem, which I also mentioned at the end of my comment. It’s sophisticated stuff but it’s tres cool. The Duistermaat-Heckman theorem became popular in physics circles in the late 80’s, or maybe the early 90’s, when Witten used it to notice that in some quantum mechanics problems the semiclassical approximation gives the right answer. The basic idea is that certain integrals are miraculously easy to compute. And the simplest one is the integral for the area of a sphere: it matches the area of the cylinder into which it snugly fits (not counting top and bottom). 2. the cylinder with base equal to a great circle of the sphere and height equal to the diameter is 1½ times the sphere. 1. Let ABCD be a great circle of a sphere, and AC, BD diameters at right angles to one another. Let a circle be drawn about BD as diameter and in a plane perpendicular to AC, and on this circle as base let a cone be described with A as vertex. Let the surface of this cone be produced and then cut by a plane through C parallel to its base; the section will be a circle on EF as diameter. On this circle as base let a cylinder be erected with height and axis AC, and produce CA to H, making AH equal to CA. Let CH be regarded as the bar of a balance, A being its middle point. Draw any straight line MN in the plane of the circle ABCD and parallel to BD. Let MN meet the circle in O,P, the diameter AC in S, and the straight lines AE, AF in Q, R respectively. Join AO. Through MN draw a plane at right angles to AC; this plane will cut the cylinder in a circle with diameter MN, the sphere in a circle with diameter OP, and the cone in a circle with diameter QR. = (circle, diam. MN) : (circle, diam. OP + circle, diam. QR). HA : AS = (circle in cylinder) : (circle in sphere + circle in cone). Therefore the circle in the cylinder, placed where it is, is in equilibrium, about A, with the circle in the sphere together with the circle in the cone, if both latter circles are placed with their centres of gravity at H.
Similarly for the three corresponding sections made by a plane perpendicular to AC and passing through any other straight line in the parallelogram LF parallel to EF. If we deal in the same way with all the sets of three circles in which planes perpendicular to AC cut the cylinder, the sphere, and the cone, and which make up those solids respectively, it follows that the cylinder, in the place where it is, will be in equilibrium about A with the sphere and the cone together, when both are placed with their centres of gravity at H.
HA : AK = (cylinder) : (sphere + cone AEF). Therefore cylinder = 2 (sphere + cone AEF). Therefore cone AEF = 2 (sphere). Therefore, sphere = 4 (cone ABD). and imagine a cylinder which has AC for axis and the circles on VX, WY as diameters for bases. = 3/2 (sphere), from above. Cool! I can’t really follow this kind of argument without painstaking work, which I haven’t done… but I’m glad you made Archimedes’ actual argument available here. The Archimedes Palimpsest is a wonderful thing, and it’s equally wonderful how people rediscovered it and used high-tech methods to extract the information hidden in it… like this proof! For example, Archimedes proved that the area of a section of a parabola is four-thirds the area of the triangle inside it (shown in red in the diagram below). To do so, he built a straight-lined figure that’s an approximation of the curvy one. Then he showed that he could make the approximation as close as anyone could ever demand to both the section of the parabola and to four-thirds the area of the triangle. Critically, Archimedes never claimed that by adding triangles forever, you could make the straight-line construction exactly equal to the section of the parabola. That would require an actual infinity of triangles. Instead, he just said that you can make the approximation as good as you like, so he was sticking with potential infinity. A consequence of “equal areas from equal thicknesses” is that the tropics (assumed here to be +/- 30 degrees latitude) contain fully half the Earth’s surface area. A slice from -30 to +30 is as thick as the -90 to -30 and +30 to +90 slices put together. Also, as noted on the Azimuth wiki, the flux absorbed by the Earth’s surface is reduced not only by atmospheric absorption of incoming solar radiation, but by reflection to space. Indeed! I’ll fix my remark suggesting that it’s just absorption that does it. If we “drop” a unit needle at random on a 3-dimensional space ruled by parallel planes at unit intervals, and p is the probability that the needle hits one of the planes, then p=1/2. The above statement is equivalent to the area formula for the sphere, so if you can prove the above without assuming the area formula, then that would “explain” the area formula. I wonder if any of the clever ideas that have been brought to bear on Buffon’s needle could apply here. For example, the reasoning behind Buffon’s noodle tells us that if we drop a 2-dimensional probe at random into ruled 3-space, the average linear measure of the intersection depends only on the area of the probe. So if the area of the probe is A, then the number of hits is (say) cA. Using a 1-by-h rectangular probe (h≈0), and borrowing our knowledge of Buffon’s needle in the plane, we can show that c=πp/2. So if we could somehow obtain c=π/4 by independent means, we could infer p=1/2. Cauchy’s surface area formula says that the surface area of a convex subset of is 4 times the expected area of a shadow. More precisely: write Gr(3, 2) for the set of planes through the origin. There is a unique probability measure on Gr(3, 2) that is invariant under the natural O(3)-action. For P in Gr(3, 2), write for orthogonal projection. Cauchy says that for a compact convex , the surface area of X is 4 times the expected value over all P in Gr(3, 2) of area( ). Here “expected value” is to be interpreted with respect to that invariant measure. One strategy for proving this is as follows: (1) show that the surface area of a convex set is proportional to the expected area of a shadow; (2) work out the constant of proportionality by taking some particular X for which you know both the surface area and the expected area of a shadow. This is extremely close to the solution to Buffon’s needle problem explained here. Part (1) is an entirely conceptual, no-need-to-write-anything, argument—definitely no calculus. It’s as elementary as the Buffon argument. However, the space usually used in part (2) is… the sphere! So this doesn’t immediately help you. However, it does get us somewhere. Suppose you can find some convex for which you know that the surface area is 4 times the expected area of a shadow. Then that tells you that the same is true of the sphere. It implies that the average radiation received on the ground from a random direction above the horizon is one-half the radiation received from the azimuth. If we include night time (when no radiation is received) the average radiation is one fourth the radiation received from the azimuth. This argument shows that the shadow of a convex body must be on the average one fourth the area of its surface, if we assume directions of the radiation are uniformly distributed in the sky. I’m a bit confused. First, I don’t understand how you’re using the word “azimuth”. (I guess contributors to this blog really should know that word, but apparently I don’t.) Wikipedia tells me that it means a horizontal angular measurement, but that doesn’t seem to fit with how you’re using it. Second, doesn’t Nathan Urban’s observation about the tropics depend on the theorem of Archimedes? For André Joyal’s reply to Tom’s questions above, go here. You’re forgiven. You’ll notice that I didn’t start off this blog by explaining what “azimuth” means and why I’m calling this blog “Azimuth”. I prefer to leave this as a little puzzle. But I also chose this word because it sounds cool and most people don’t know what it means. So, people can project into it whatever emotions and feelings they want. “[…] inaccurate reading of the Arabic expression سمت الرأس (samt ar-ra’s) meaning “direction of the head”/”path above the head”, by Medieval Latin scribes in the Middle Ages, probably through Old Spanish. It was incorrectly reduced to ‘samt’ (“direction”) and imprecisely written as ‘senit’/’cenit’ by those scribes. Through Old French ‘cenith’, Middle English ‘senith’ and finally ‘zenith’ first appears in the 17th century. André probably wanted to say “zenith” which indeed sounds a lot like “azimuth” Both words entered our language via Arabic: سمت الرأس (path above the head) and السمت (direction). Source: Wikipedia. I haven’t tried to carry it out, but the obvious choice to try for (when the sphere is out) would be a regular tetrahedron. There may be some geometric argument to let you reduce the expectation in Cauchy’s formula to looking directly (i.e. perpendicularly) at one of the four faces, and then you’d be done. I hadn’t thought of a tetrahedron. I had thought of a long thin cylinder. That, I think, reduces it to the following similar problem: what is the expected length of the shadow cast by a line segment on a random plane in ? It’s proportional to the length of the line, but again the challenge is to find the constant of proportionality. Right, and seeing that the constant is 4 almost amounts to Archimedes’s observation again. I’m a bit confused. First, I don’t understand how your using the word “azimuth”. (I guess contributors to this blog really should know that word, but apparently I don’t.) Wikipedia tells me that it means a horizontal angular measurement, but that doesn’t seem to fit with how you’re using it. I thank you for the correction. I was wrongly naming the vertical direction, the “azimuth”. I wanted to say that the sine of the ALTITUDE of a star above the horizon is on average equal to one half, the sine of 30 degrees. I am no longer sure it follows from Urban’s observation. Archimedes is saying that the quantity sine(altitude) is uniformly distributed between 0 and 1. I am saying that its average is equal to one half. Urban is saying that its median is one half. It may be possible to prove my statement without using Archimedes’ result, but I don’t know. By the way, I think the blog doesn’t allow too many levels of indentation, in order that the text columns don’t get too thin. Hence, replies to replies to replies don’t themselves carry a “reply” button. In order to reply to them, you have to scroll up to the previous “reply” button and click on that. It’s maybe not the best system, but I think that’s how it works. That’s how it works: just three levels of reply. David Tweed (the person formerly known as “bane”) has given me some code that I might use to fix this, but I haven’t gotten around to trying it. This annoying property of our poor planet — that the average density of solar power hitting its atmosphere is just 1/4 the solar power density streaming through space — cannot be fully blamed on it being spherical. In fact any planet that’s convex in shape would have this property, with the exact same number 1/4, if it tumbled randomly through space. But phrased this way, one can’t help notice that planets don’t usually tumble randomly through space. They usually rotate around some axis. So here’s another puzzle: imagine a convex shape that spins at constant speed around some fixed axis. Hold the Sun at some fixed position. Can we get the average density of solar power hitting this object’s surface to be more than 1/4 the density of solar power streaming through space? For a sphere, we get only 1/4. Would an object of some other shape do better? If the object doesn’t spin, we can do as well as 1/2: just take a flat object facing the Sun. But what if it spins? This is a spherical cow of an answer, but: consider a cubical planet. The axis of rotation passes through midpoints of opposite faces, and the sun is in the plane orthogonal to that axis. The factor is now , which is bigger than 1/4. Now you might ask for a planet that has rotational symmetry about its axis. I don’t know what the answer to that is. Does your calculation here take into account the fact that the top and bottom of the cube never get any sun? If not, and if that’s a problem, I think it’s an easy problem to fix: use a rotating flat shape instead of a cube. If I understand you correctly, as long as the shape is rotating around an axis orthogonal to the direction of the sun, we’ll get a factor of 1/π. You’re right on both counts. I was forgetting the top and bottom of the cube. Also, there’s no reason why it has to be a cube. Let be any compact convex subset of the plane, and let our planet be the product , rotating about any axis perpendicular to . (It doesn’t have to pass through the “centre” of , whatever that means.) I took to be a square. But you could take to be a disk, which means that your planet is a cylinder. That’s slightly less unlikely than a cubical planet! The same argument then applies: we’re effectively now in 2 dimensions rather than 3, and since the diameter of a disk divided by its perimeter is , that’s the factor. At least, it would be the factor if it weren’t for the top and bottom of the cylinder; but you can eliminate problem to as fine an accuracy as you like by taking a long, thin cylinder. So I think we can conclude that for a cigarette-shaped planet rotating about its long axis, with the sun in the plane orthogonal to it, the factor is only slightly less than . By the way, this discussion is slightly less impractical than it may seem, because even though planets are close to spherical, people are already thinking about launching artificial satellites to catch solar power, and we can make them any shape we want. It seems that one popular scheme is to have a satellite in geostationary orbit, so it revolves around the Earth once a day. This makes it act like it’s hovering over a specific location on the equator, allowing it to beam power down in the form of microwaves. Since the transmitter would need to point towards the Earth all the time, it’s indeed natural for the satellite to rotate around a fixed axis orthogonal to the direction of the Sun. So, the optimization problem we’re discussing now is indeed relevant… though there are doubtless many complicating issues which our discussion so far neglects. One obvious complicating factor, the Earth’s shadow, is not such a big deal: apparently a satellite in geostationary orbit is only in the Earth’s shadow 1% of the time. However, it seems that the idea of space-based solar power is extremely impractical at present. It takes a lot of energy to send stuff into space, and beaming microwaves down and collecting them is extremely inefficient unless you have a huge transmitter and collector: in 1978, a NASA proposal involved transmitting antenna 1 kilometer in diameter, and a receiving antenna 10 kilometers in diameter. So, I’m not actually interested in this math problem for any practical reason! It’s just fun. rather than 1 million miles. we need either a preview feature, or an edit feature, all the wiki cites don’t work because I didn’t leave a space between the URL and the end paren… arrgh. Yeah. I’ve asked before if anyone knows a way to equip a WordPress blog with these features — I’m not the sort who enjoys spending my time figuring this stuff out, and there’s no obvious button to click that does the job. I have bought the ability to edit the cascading style-sheet of this blog, which might help. I fixed your links. I guess the computer isn’t clever enough to guess when your URL ends if you don’t leave a space. Our chances of connecting a geostationary satellite to the Earth with carbon nanoribbons looks pretty slim when we can’t even get this stuff to work. If we can use average values in solving the puzzle then it’s pretty quick. Various 2D constructions can show that the average value of the positive portion of the sine function is 2/pi. Then the area of the sphere is pi*2/pi*R*2piR. Could a soap bubble type of solution yield insight? Inflate a circle into a half sphere (keeping a ring), and it stretches into exactly twice the area. Although it may break the rules, minimizing integrals etc., maybe it would help someone. Isn’t the number four the number of dimension plus one? No; I think its significance is that it’s , where is the volume of the n-dimensional ball of radius 1. I’ll write . In general, alternates between being a rational number and a rational multiple of . It’s not usually an integer or an integer multiple of ; that’s just some good luck in low dimensions. Ah, good point. This probably means my suggestion above of considering a tetrahedron is misguided, because if it worked, it would probably generalize to higher dimensions to give instead of . There’s another derivation of the factor 4 from Archimedes’ fact (“same thickness implies same surface area”). It avoids cylinders. Consider pairs (S,S’) of spheres such that the midpoint of S lies on S’ and such that they intersect. We denote their radii by R and R’, respectively. We investigate the surface area A of the part of S’ that lies inside S.
Now think of S as being fixed and let S’ vary (with the boundary condition that R’ is at least R/2). The argument above shows that A also remains fixed. In one extreme case, namely R’=R/2, S’ touches S from inside and it is half as large as S. Therefore, A is 1/4 of the surface area of S. In the other extreme case, where R’ goes to infinity, S’ becomes a plane through the midpoint of S. In this case, A is the area of a circle of radius R.
Very suggestive picture of the factor 1/4. Having reflected for a while I think the most straightforward way that Archimedes might have demonstrated his very nice finding that the surface area of the sphere is equal to 4 times the area of one of its great circles is just as you’ve done in the first place far above, by first proving equivalence to the surface area of the open cylinder which just contains it. That is a simpler proof than the one given by Archimedes himself isn’t it (thanks streamfortyseven)? What am I missing here? Lacking imagination, I can’t imagine how a proof might be made more straightforward than the one you’ve given. Full disclosure: I managed to either overlook that you’d given that proof, or forgot, and rederived it myself. In the process I considered all manner of uglier and more complicated ways of doing it to finally conclude that there was a nice feeling of irreducible simplicity to that one. Perhaps the only term of art that you’ve omitted from it is “method of exhaustion”, which Archimedes knew well anyway. Is it just that you’ve elided the actual calculation above, using instead the words “magic fact”? The geometry and calculation are perfectly elementary anyway, I think the only magic needed is the term “method of exhaustion”. Consider bands of a containing cylinder that may be pictured as slicing a sphere into what on Earth, for instance, would be called bands of latitude. We wish to know what the surface area of each band on the sphere might be relative to the corresponding band on the cylinder (in fact we wish to prove that they are equal). 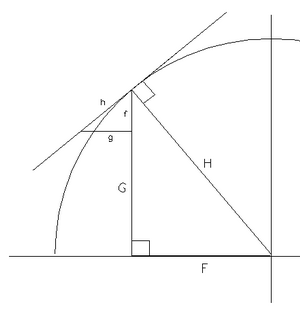 In the diagram let f on the small right triangle be the height of a (small) band on the cylinder. On the sphere the respective small longitudinal arc of surface has length quite close to h, larger than f. Draw the right triangle of sides f, g and h. Note that this is similar to the larger right triangle of sides F, G and H where H is a radius of the sphere drawn to a point in the (small) surface band we’re considering. The surface area of any slice of a sphere matches the surface area of the corresponding slice of the cylinder with the same radius. indeed make it obvious, not at all “magic”, that the diminished radius of a slice from near the top or bottom of the apple will exactly cancel the increase in its surface area due to being “sloped”. And then, as you note, a little integration (or “exhaustion”) finishes the job. But just as Newton took results he’d proved using calculus and reproved them using Euclidean geometry in the Principia Mathematica to make them “more rigorous”, I wouldn’t be surprised if Archimedes did the same, at least some of the time! Thanks John! It seems it’s inherent in Nature that there exist diverse, orthogonal even, ways of understanding or appreciating almost all true things, and it’s a demonstration of the power of mathematics that Newton or Archimedes or people posting on Azimuth can give differing yet equally valid proofs of a theorem, each casting light from a different and sometimes fascinating angle. Wonderful! Yes, it’s great — and I love how old things like A = 4πr2 still reveal a wealth of surprises if you poke at them. For the 2-d sphere, I rather like Gauss’ angle deficit formula for spherical triangles, which is a gem of dissection geometry — Coxeter gives a clear description of it in his undergraduate-level text — but it occurs to me that there should be a clean way to compare the angles and edge arcs of a spherical triangle as well, from which the 4 ought to appear again… sorry this is in my usual vague style, but I’m now remembering appointments and must dash! I don’t quite get what you’re saying, but it sounds like you’re saying Descartes’ theorem — that the total angle defect of any polyhedron that’s topologically a ball must be 4π — should yield a proof that the area of a sphere is 4πr2. That would be nice. I bet it does. And if it does, we should be able to generalize from a round sphere to any convex body. Challenge: use Descartes’ theorem to show that the surface area of any convex polyhedron is 4 times its average shadow area! But Descartes’ theorem doesn’t only apply to convex polyhedra: any polyhedron homeomorphic to a 3-ball will do. So this makes me want to generalize the result about “average shadow area” to all such polyhedra. And I think I see how. We just need to generalize the concept of “average shadow area” in the right way, so that an X-ray crossing the body’s surface 2n times contributes n as much to the “average shadow area” than a ray that crosses it just twice. With this definition I bet someone can use Descartes’ theorem to prove that the surface area is 4 times its average shadow area for any polyhedron homeomorphic to a 3-ball. No, I’m referring to the spherical geometric fact that the area A of a triangle in the unit sphere with inner angles a,b,c is A=(a+b+c-π); the trick, of course, is getting that factor of 1 — the disection argument will show the two sides are proportional. Oh, for non-convex things, you need to count the multiplicity of a point in the shadow (or more generally, you need the Euler characteristic of an intersection … but that’s for other intrinsic volumes). and then play around with how . It’s not so neatly “picture-y”, but these are formulas all the astronomers ought to have known at some point. John, your generalization of “shadow area” to take account of multiplicity corresponds exactly to something standard in integral geometry. We’ve been talking about projections onto 2-dimensional subspaces of 3-dimensional space, so I’ll stick to that case, but everything I’m about to say generalizes in the way that you’d guess to any pair of dimensions. I mentioned that there’s a canonical probability measure on the space Gr(3,2) of planes through the origin in 3-dimensional space. There’s also a canonical measure (at least, canonical up to a scale factor) on the space Graff(3,1) of lines in 3-space, not necessarily through the origin. Here “Graff” is a funny abbreviation for “affine Grassmannian”. Now let X be any subset of 3-space. The expected area of the shadow of X on a random plane is the same as the measure of the set of lines that intersect X. (Think about L being orthogonal to P. Also, I’m assuming that we’ve normalized appropriately.) In that sense, it doesn’t matter whether you project onto planes or intersect with lines. This is a much less ad hoc way of expressing it than anything involving area-with-multiplicity. where is some positive constant that can be worked out once you’ve decided how your measure on Graff(3,1) is to be normalized. This is usually called (an instance of) Crofton’s formula. Gorgeous stuff as usual, Tom! Good — it seemed pretty natural, so it would be depressing if people were so silly as not to have noticed it before. By the way, I now think the answer to my “Challenge” is very easy if one lets oneself use a bit of machinery. Taking a suitable limit, Descartes’ theorem gives a special case of the Gauss-Bonnet theorem, which says that the integral of the scalar curvature over a surface is 2π times its Euler characteristic. Namely, it gives the special case where our surface is a sphere embedded in R3: it says that the integral of this sphere’s scalar curvature must be 2π × 2 = 4π. But a round sphere of radius 1 has scalar curvature 1. So, the area of this sphere must be 4π. This could be seen as a pathetically obscurantist way of computing the area of a sphere, but my point is rather to illustrate that the 4π in Descartes’ theorem is directly connected to the 4π in the formula for the area of the sphere. And probably all this generalizes enormously, and probably that’s already been done. Whoops! It turns out that this proof by Archmimedes — and a whole lot of other stuff — was a hoax. Is it possible to find a spiral which can be used to cut the surface of the sphere in very small (infinitesimal) slices which then can be rearranged to obtain a circle of radius double to that of the sphere? The circumference of the disk is double the sphere’s equator, but the equator has two sides. Half of the slices of the disk come from one hemisphere, half from the other. This image illustrates the idea.